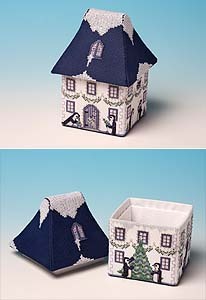 The Penguin Hall Cross-Stitch Keepsake Box kit makes a useful sized blue and white box in the form of a House, with Penguins decorating their home ready for Christmas. Fully lined, the box is opened by removing the roof. When complete the box is approximately 14.8 cm (6 inches) high, and 8.3cm (3 ¼ inches) square. The kit includes: 18 and 14 count Aida Fabric, Evenweave lining fabric, DMC stranded embroidery cotton, beads, pre-cut plastic canvas shapes, tapestry needle, cross-stitch chart and full instructions.